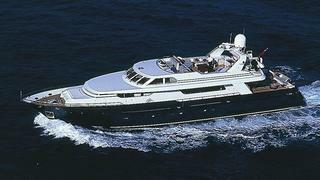 A call to Cape4 Yachting confirms that the 31m motor yacht Ninemia is now sold with no other brokers involved. Built by Vitters in 1995, she was designed by Willem de Vries Lentsch and combines high performance with the classic profile of more conventional yachts. She can achieve speeds in excess of 30 knots. Ninemia features a large sun deck with lounge seating for numerous guests, and two hydraulically-controlled high-low tables transform it into a dining area for 10 guests. The interior, by French designer Isabelle Blanchère, is exquisitely finished in mahogany, with a large, comfortable lounge and separate dining area. Accommodation is for 10 guests, consisting of a spacious owner’s stateroom with two bathrooms and three additional double cabins with ensuite facilities. Ninemia was asking €1.95 million.